Expectations have been high for "Scott Pilgrim vs. 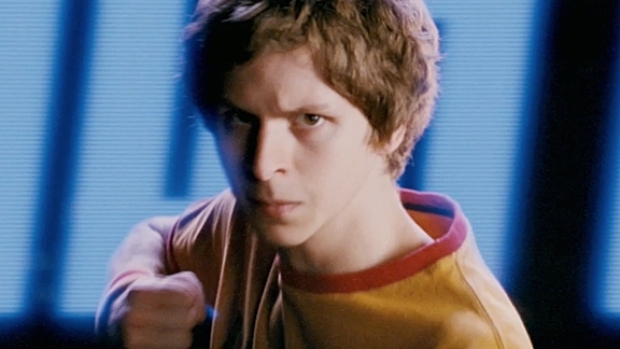 The World," the comic-book adaptation starring Michael Cera, and the latest trailer to hit the tubes does nothing to dispel those hopes. "Scott Pilgrim vs. The World" (from our overlords at Universal Films) stars Cera as a young man who falls for Ramona Flowers, played by the ready-to-breakout Mary Elizabeth Winstead, a young woman with seven evil ex-boyfriends. In order to keep her, Pilgrim must face each of them in battle. Yes, Cera again plays the sweetly mopey guy in a hoodie, but this time he also in engages in all manner of badassery in this film directed by Edgar Wright, a man who has shown a gift for blending comedy and action in such films as "Hot Fuzz" and "Shaun of the Dead." Wright appears to have done a nice job of bringing a comic-book feel to the film, while mixing in video-game elements and a touch of "Matrix" to give the film unique look. The supporting cast is loaded as well, with Aubrey Plaza ("Parks & Recreation"), Kieran Culkin (who came so close to having a very good career) and Anna Kendrick, who incredibly still awaits a lead role. Add to all this a soundtrack featuring the talents of Dan "The Automator" Nakumura, Beck and Broken Social Scene, which the guys at 24 Bits hailed back in December of '09 as the best of 2010, and you've got what promises to be a ripping good time. "Scott Pilgrim vs. The World" opens Aug. 13.